Set the "noise / vanished" tokens next to the board. Place the U-shaped, turn marker on the "1" space of the turn track (at the upper right of the board). Place the "# novices captured" marker above the track. Decide who will play the guards. Place both guard figures in the Abbess's Cell (location 26). Draw and assign a Blessing card for each guard figure. Take the guard movement cards. All the non-guard players are novices. 1 random novice token. Start your novice token in her own cell (locations 1-6). 1 Secret Wish card. Keep the information on this card hidden from other players. 1 random Blessing card. Keep this card hidden from other players. Your novice status card, a novice log sheet, and a writing utensil (not provided). Place your status card on the "On the Run" side (not the "Caught" side). Do not look at the unassigned Secret Wish and Blessing cards. Return them to the box. Each novice and each guard receives a Blessing at the beginning of the game. If there is only one guard player, make sure that the two Blessing cards are assigned separately and used only by the assigned guard. A Blessing is a one-time advantage you may use during the game. Once you use it, place it back in the box, out of play. If no one has won before the end of the 15th turn, the guards win and the game ends. Important: At the beginning of the game, the novices get 2 movement phases. Both are part of the first turn of the game. Move the novices twice following the rules below, and then the guards may move for their 1st turn. As a novice player, you have a Secret Wish card. This shows a set of keys and the locked location of the secret item. To win, you must first obtain the keys, then pick up your item, and then return to your cell. If you are the first to do this and you do so before the end of the 15th turn, you win the game! Note your movement on your log sheet (moving your token on the board if seen). Reveal a movement card based upon the distance you moved. 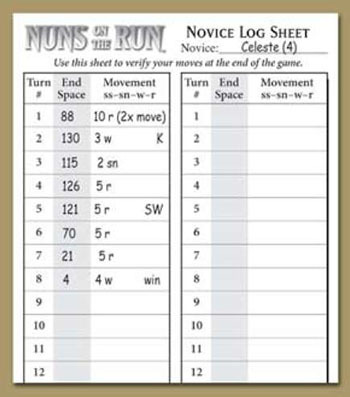 Instead of moving your novice token on the board, you keep track of your movement by making notations on your log sheet. Each turn, you may move from 0 to 5 dots depending upon the movement card you chose. Note the dot on which you end your movement and how many dots you moved. Also note the movement card you used (st = standing still, sn = sneaking, w = walking, r = running). During your first turn, you move twice (using the same movement card). All novice players do this step simultaneously. Your first destination should be to retrieve your set of keys. You may only pick up the set that is noted on your Secret Wish card. In order to pick up your keys, you must end your movement for a turn on your keys' location. (The number of dots that you move determines how you are moving; see below). Write a "K" on your log sheet next to the location when you pick up your keys. Once you have the keys, you may pass through any locked door (including other color keyholes, and of course into the locked room with your object in it). If you are ever captured, you may keep your keys. Each time you move to a dot, check to see if you enter a guard's line of sight (see "The Guard/Moving Guards on Paths"). If you are seen, move your novice token from your cell to that dot. As long as you are in a guard's line of sight move your token in addition to keeping your log. If you move to a dot and leave the guards' line of sight, place a Vanished token between the dot you were last seen at and the next dot in the direction you traveled. You do not have to move in the direction of Noise or Vanished tokens. You may move in any direction while tokens (or a visible novice) are on the board. This enables you to try and cut off a novice or to go after another novice you suspect of being closer! If you have reached your Secret Wish location, you must end your movement for the turn. Write an "SW" on your movement log next to the location to indicate that you have picked up your object. If you are caught by the guard, you are required to walk (not run) in the direction of your cell by the most direct route, as long as you are visible to the guard. Flip your novice status card over to "caught" as a reminder. If your status card has its "caught" side up, do not place Vanished tokens and do not roll the die for noises (you get a short reprieve from being caught!). In addition, if you end a turn out of the line of sight of the guards, return your token to your cell and flip your novice status card to the "on the run" side. During the next turn, the normal novice movement rules apply. 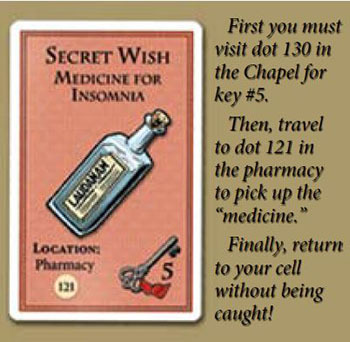 If you have already reached your Secret Wish location and then are captured, you must go there again and then return to your cell to win. In general, the faster you move, the louder you are while you are moving, and the greater the chance that a guard will hear you. If either guard played her Walking card during the previous turn, you and the other novices must each roll the die (clockwise from the guard player). You apply the Noise roll modifier for the movement card you just played. The modified result is the distance that walking guards can hear the noises your novice made. Count from dot to dot along any path and through doors. If a guard is in the roll's range, you must place a noise token next to the guard figure in the direction of the shortest path from you to the guard. If there are two equal but separate paths that the noise can travel on, place a Noise token on either, or both, path(s). Even if there is already a Noise token adjacent to the guard, place another. 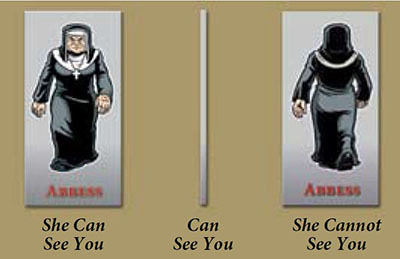 As the guard player, you control the Abbess and the Prioress (referred to collectively as the guards). 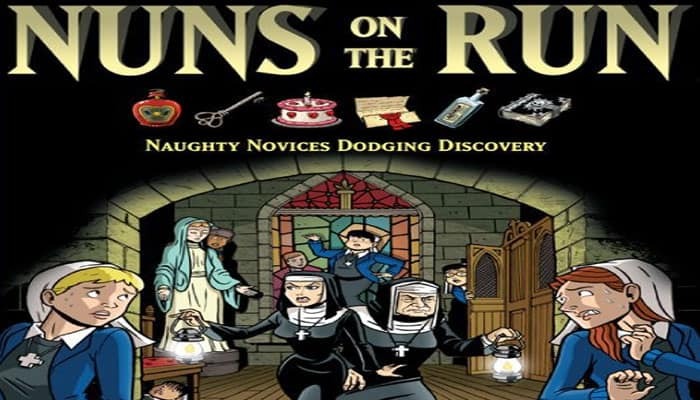 You move around the convent, looking for and capturing novices who are out of their cells, sneaking around the convent. You win if you accumulate capture points equal to the number of players. You also win if no novice has won by the end of the 15th turn. With 8 players, the two guard players win or lose as a team! Move each guard along her "path" (looking for novices). Reveal the applicable movement card for each guard. Clear any noise or vanished tokens from the board. As the guard player, you move your Abbess and the Prioress figures in pre-planned paths from dot to dot. Normally, if novices remain quiet and unspotted, you follow the colored paths on the board. However, you can leave those paths if you suspect (either by seeing or hearing) a novice is out of her cell! Novices: Unless a guard sees you, your token stays in your cell on the board, even though you might be roaming around the convent! You will record your movement on your log sheet. You start the game with a set of guard path cards. Each guard should always have one of these cards assigned to her (face up). Anytime you complete a path with a guard figure, discard the used path card. 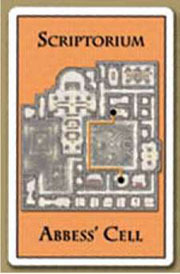 Then, from your remaining cards, choose another guard path card that shows the figure's current location. 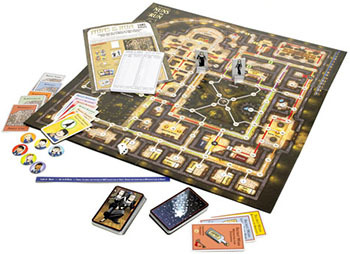 At the beginning of the game, you may choose from any of the 8 cards showing the Abbess' Cell on it (location 26). Each guard has her own path, and each may start a new path independently of the other. Your guard figures are always at their actual location on the board. When you move, you move your figure along her route (in order for novices to determine if they are seen). Make sure your figure is facing front, in the direction of travel. Each turn, each of your guards may either walk (advance 3 or 4 dots) or run (advance 5 or 6 dots). Walking allows a guard to hear noises made by novices out of their cells. Running is useful for catching a seen or suspected novice, but a running guard can't hear noises! Some doors are marked with a lock symbol; these are locked doors. Each guard is equipped with a set of keys that provide her access to any door or passage. A door never blocks a guard's movement. Novices: Your first stop out of your cell should be to pick up a set of keys. Once you have these, you may enter any door as well. As long as no one is detected, each of your guards will continue to follow the path on the card until she reaches her destination (the black hexagon dot at the end of the path). A guard will not change direction until her path is completed. If a path is completed in the middle of a movement, you may immediately select a new path that starts at your current location and continue moving. Novices: There are two ways that a guard can divert from her paths to chase novices-either by seeing you (you are in her line of sight) or hearing you (if you are moving too fast, she will hear your footsteps). 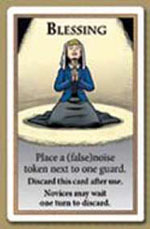 Some Blessing cards can create false noises-useful for diverting a guard from you (or causing a guard to see others)! Each time a guard moves to a new dot (that is, every dot visited on a turn), each novice must check to see if she is spotted (i.e., in the guard's "line of sight" as defined below). A guard that spots a novice may immediately move freely in order to catch the novice(s). "Line of sight" is defined as an 180° arc from the front of the guard figure (the figure always faces the direction of movement). This means that a guard can see everything in the same row that it is on, and all rows in front of it, unless a door or a solid wall blocks the view. Trees, columns, and statues do not block line of sight! If you have any questions, the guard player may only use the tile straight edge provided to show a line from the center of one circle to the target circle. If there is a wall in the way, the dot is not visible. The limit to vision is 6 dots; if the shortest distance between a guard and a novice is greater than 6 dots, the novice cannot be seen. There are some tricky line of sight areas on the board-primarily the Cloister, the Chapel, the Gardens, and the outside path. Most room passages have doors (blocking sight), but several do not (10 to 11, 7 to 8 to 9, 118 to 119). The Outer and Inner Gardens have four corners that can be used as blind spots. They also have some very long lines of sight that are blocked by the 6 dots limit. In addition, dot 82 is actually up the tree! The only way to see someone at 82 is to be at dot 82. In the Cloister, the columns do not block line of sight, but the wall around dot 67 does. For example, dots 46, 67 and 68 are blocked from 91 by that wall. On the outside path, the curve of the outer wall blocks some line of sights. Within the Chapel, the columns do not block sight (e.g., 112 is visible from 105). However, the wall around the altar does block sight (e.g., 134 is not visible from 114, and 150 is not visible to any dots other than 134 and 135). In addition, the confessionals at 103 and 107 are not visible to anyone unless they enter those specific dots. A guard will never look backwards as she moves. If there is a turn, she turns, looks along her new field of vision, and then proceeds in her new direction. She sees a Vanished token. She has a Noise token next to her. For any of the above, a guard may immediately move from her pre-planned path in ANY direction (not necessarily the direction of the Noise/novice)! You may still move between 3 and 6 dots, and if you walk (3 or 4 dots), you will still have the opportunity to listen for novices at the end of the turn. If only one guard heard the noise or saw a novice, only that guard may freely move; the other guard must continue to follow her path. If there are no more Noise tokens or visible novices at the beginning of a movement turn, the guard(s) will return to her/ their path(s) by the shortest route possible, and resume her/their path(s) in the same direction of travel as before. If one of your guards moves to a dot containing a novice, the novice is captured, lectured, and sent back to her cell. The novice must move towards her cell, and loses her Secret Wish if she already has it. You score 1 point and move the "# Novices Captured" marker (not the turn marker!) up one on the turn track. You may continue to move after capturing the novice. You can catch the same novice more than once during the game-you score a point each time you capture her. If you, the guards player(s), score points equal to the number of players, you win! Novices: Being captured is bad: you will be forced to walk in the direction of your cell as long as you are visible to the guard, and you lose your Secret Wish. However, you get to keep your keys, if you have already picked them up. After both guards move, reveal the movement card for each guard. A guard cannot choose to move less than her speed dictates (e.g., a running guard could not move only 4 dots). Remove all noise or vanished tokens from the board. No token lasts longer than one turn (although the same novice may trigger another token immediately). Each guard that played her "Walking" movement card during the current turn rolls a six-sided die. This is that guard's base distance at which she can hear noises. She counts from dot to dot along any path and through doors. Each novice that is within this base distance applies her Noise roll modifier as shown on her movement card (see page 4). If the distance between the novice and the guard is less than or equal to the novice's modified result, that novice must place a Noise token next to the guard figure in the direction of the shortest path from the novice to the guard. If there are two separate paths of the same distance, place a Noise token on either, or both, path(s). If there is already a Noise token adjacent to the guard, place another. Each novice within range of a walking guard must place a Noise token (the guards hear many sounds!). A novice within range of both guards must place a Noise token for each guard. Novices: You also roll for noises that you may make at the end of your movement. A high die roll is good for the guards and bad for you! A Blessing may be played during the part of the turn that the action is applicable to. If you have a Blessing that changes the die roll, play that after the die roll you want to modify. The False Noise card allows the guard to divert from the path in the direction of the "noise" next turn! Novices: If you have the "False Noise" Blessing, you may place the noise token down during this phase. If you do, do NOT reveal this card until this phase of the NEXT turn! Slide the turn marker down one step on the turn track. The current turn ends and it again becomes the novices' turn to move. The game ends at the end of the 15th turn. A NOVICE wins if she obtains her keys, obtains her Secret Wish, and returns to her cell with her object. The game ends immediately. If two or more novices win on the same turn, the novice who was caught the least number of times wins. If still a tie, the tied players share their victory! Note: If you are caught while traveling from your Secret Wish location to your cell, you must revisit your Secret Wish location to win! The GUARDS win if they accumulate capture points greater than or equal to the number of players (e.g., 6 capture points in a 6-player game). They also win if no novice wins by the end of the 15th turn of the game. Agree before play begins if you want to use one or both of these variants! When you choose "running", you must move exactly 5 dots. If an experienced guard player is up against inexperienced novice players, you can handicap the guard player by limiting the guards to a maximum movement of 5 dots.